UK angler Richard Larkin once again returned to Palm Tree Lagoon in search of predatory giants. Richard chose to fish for both the many carp species and predators which reside in Palm Tree Lagoon and fished two rods with Fox 4oz Method feeders loaded with local groundbait and flavourings. In addition Richard also set-up a heavier rod with a Fox ball float and strong fluorocarbon hooklink of 80lb’s. After heavily baiting a marginal area Richard positioned the rods with a light under arm cast before placing the rods on the floor. Richard then cast out his float set-up to the centre of the lake in an attempt to hook one of the lakes resident Arapaima or Chaophraya Catfish. Several tentative plucks on the float alerted Richard to a take and saw him swiftly striking into a predator some 50 yards out into the lake! 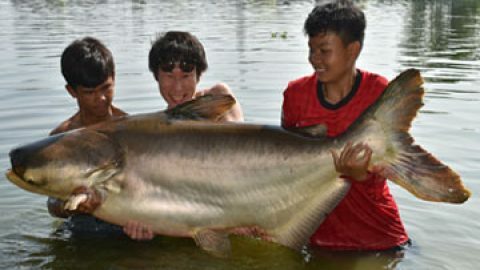 A massive swirl erupted in the centre of the lake as a large Chaophraya Catfish dived towards the bottom. Applying maximum pressure the angler attempted to turn the fleeing fish! Seconds later the hook pulled out leaving the dejected angler staring into the lake in disbelief! After the commotion of the fight the central area of the lake became almost devoid of fish due to the fish becoming spooked by the previous events. 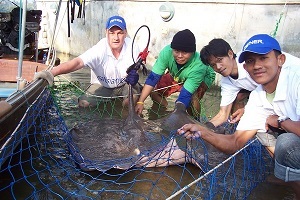 Richard continued to cast his float to the odd showing fish but was not rewarded for his efforts for a further three hours when a much smaller Chaophraya Catfish was finally landed of some 9kg’s. The rods fished to the quiet marginal area produced several small Rohu with weights to 15lb’s in addition to a decent sized Pacu of possibly 14-15lb’s. As the light was finally fading the float fished livebait was picked up in the centre of the lake by an unseen predator. On striking into the fish a distinct knocking sensation could be felt through the rod indicating the culprit to be an Arapaima thrashing its head from side to side. A ten minute battle ensued which saw the angler skillfully playing the fish towards the waiting landing net. After several spectacular aerial displays the Arapaima was finally brought into the net where it thrashed wildly in the margins.